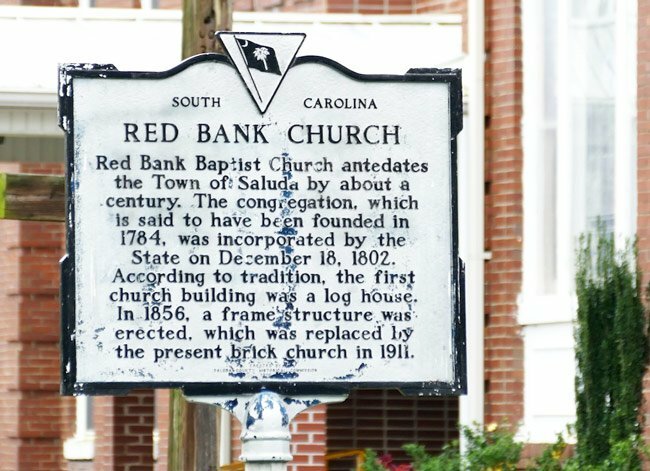 Red Bank Baptist in Saluda is the oldest church in Saluda County and houses one of the oldest Baptist congregations in South Carolina. Founded in February of 1784 – just after the Revolutionary War – members initially met outdoors beneath a brush arbor, as was common with early churches. Later that year, the congregation built a log meeting house for its services on land donated by Robert Newport. That church was followed by a wooden frame structure in 1856. In 1911 the present Greek Revival church was built, designed by architect Joseph H. Casey, who also designed much of Anderson University. 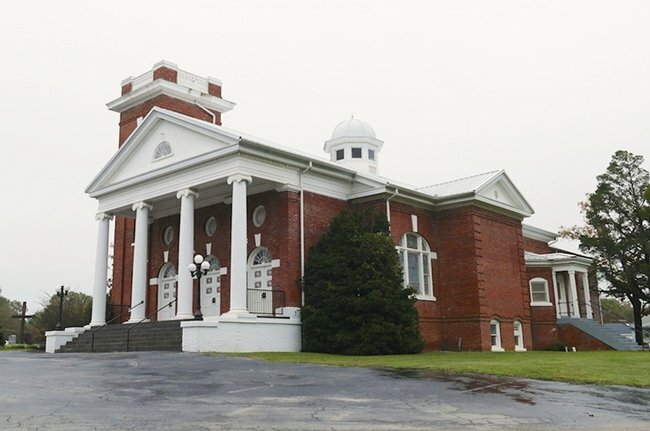 The church serves the oldest congregation in the Ridge Association, a Southern Baptist group comprised of 22 churches from western South Carolina. Importantly, two of the founding families of this church — Mark Butler Travis and his wife Jemima Stallworth Travis, and James and Sophia Bonham — had sons who fought and lost their lives in the Battle of the Alamo. In fact, William Barrett Travis and James Butler Bonham are considered among the battle’s foremost heroes. Learn more about all seven South Carolinians who fought in the Battle of the Alamo. Thank you so much for letting us know! We went ahead and added their names into the text. A most important bit of information about this church has been neglected. The parents of both Wm. Barrett Travis and James Butler Bonham were founding families of this church. You may recognize these two men who lost their lives at the Alamo.